These day's I'm all about trying to save money. Having children is an expensive business, new clothes, shoes, hobbies, school trips, days out, they all add up. So finding ways to save money on my cleaning is a must! Distinctive Chesterfields recently did some research on cleaning and they found that 41% of people disliked cleaning the Bathroom. I'm definitely one of those 41%! Over the year's I have spent a fortune on products, trying to keep it looking spick and span, but, in reality there are a few things you can find around the home which will keep your bathroom looking its best, without breaking the bank. I keep hearing people recommend lemons and I was a little dubious until I actually gave them a go. They're fantastic at getting rid of mould, just use a combination of equal parts of lemon juice and salt and scrub away mildew and mould from your tiles! They also are amazing at bringing the shine back to your taps too. What's even more fantastic about lemons as they're chemical free, so your kiddies can help too!! The perfect way for them earn their pennies. This is going to sound disgusting, but hey we all get this problem from time to time, blocked up drainpipes. Since having Henry, I'm still suffering with postpartum hair loss. It get's everywhere and it drives me absolutely bonkers! If you pour 1 cup of baking soda directly down the plug followed by 1 cup of vinegar, you should see it bubble up. This then dislodges any clogs. Perfect for my shower at the moment! Vinegar is a staple in many people cleaning cupboards, if it isn't in yours, it should be! Vinegar can be used for many things in the bathroom including, mirrors, tiles, taps, toilet, you name it vinegar will probably clean it. I found a fantastic blog post which tells you all the wonderful ways vinegar can be used in the bathroom here. If you don't fancy making your own cleaning products, many pound stores often have fantastic cleaning products at the fraction of the usual prices. Perfect if you're on a budget. 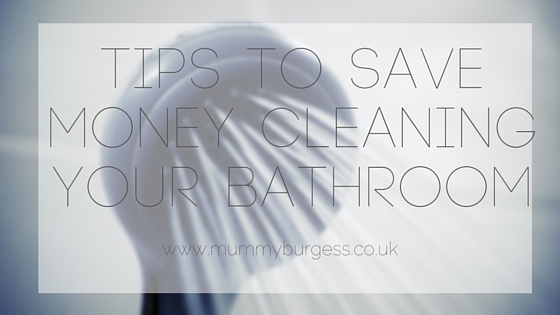 Do you have any tips on keeping your bathroom sparkling without breaking the bank? You can find even more cleaning hacks head at My Unique Home.